Dad and Janet visited today. One of the highlights was when Cian sat us all down to play the board game he just created. Cian is six. Here's a picture of the board. Each player takes turns to roll a d6 to proceed. Note the game tokens are lego pieces. 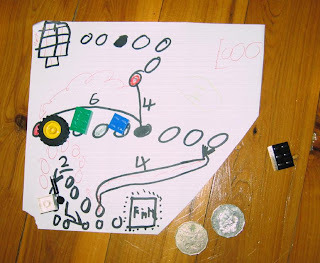 If you land on a black dot, you got a card, which could have said "go back 3" or "hold this money for 10 seconds"
To cross a bridge with a number on it, you needed to roll the exact number to cross it, that or you could add the numbers from your last two rolls. There was a complex rule about branch decisions being decided about whether or not you landed on a particular previous spot or not. It was awesome. Janet won. Oh, yeh, Janet also rolled the following during her subsequent turns: 6,6,6,5,6,5. That is like rolling up a character in D&D with an 18 and a 16. Damn!